With electricians in high demand, you can afford to be selective, and you should be. You want more than just a job. You want a rewarding career. That’s what we provide. As one of the largest electrical contractors in Colorado, Encore Electric is more than just a place to work – it’s a place to thrive. Enjoy the training and support you need to become the best craftsman or craftswoman you can be. Work in a culture where people take respect and safety seriously, and where the words ‘team’ and ‘leadership’ really mean something. Improve people’s lives by contributing to some of the biggest and most challenging projects in the Rocky Mountain region, including schools, hospitals, stadiums, ski areas and more. Explore our Encore Electric jobs at all levels of the industry, from apprentice to project manager, and take your electrical career to the next level. At Encore Electric, we provide a range of well-paid career paths, plus the training and education you need to succeed in all of them. In addition to the traditional route from apprentice to project manager, our employees can pursue CAD, BIM, VDC, preconstruction and systems. Whatever you choose, you’ll have the opportunity to advance into leadership positions and continuously develop your installation and maintenance skills on a variety of exciting projects, furthering your electrical career. You can find Encore Electric jobs here. Along with on-the-job training, our apprentice electricians receive instruction through Independent Electrical Contractors (IEC) by attending class one night a week during the school year. The training is academically rigorous involving homework, quizzes, and tests which require solid math skills. Encore Electric pays 100% of the tuition for this program. The program is one of the best electrical schools in Colorado, and throughout the region. Our Prefabrication Facility is an ideal training ground for incoming apprentice electricians to learn the materials and tools of the trade. Encore Electric pioneered the concept of “prefabrication” in our industry. By assembling electrical components in-house, for later field installation, we not only provide valuable training opportunities, but can control quality, create efficiency, and reduce costs for our company. Our Prefabrication Facility is an ideal training ground for incoming apprentice electricians to learn the materials and tools of the trade prior to being exposed to job site hazards. Learn more about the Journeyman Electrician Licensing Requirements in Colorado. 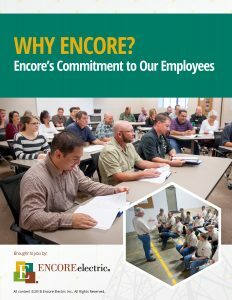 Encore Electric places a high value on the safety and well-being of our employees. We make sure we have a thorough understanding of the risks and hazards of every project. Encore provides more than thirty safety training courses through Encore University on an ongoing basis. Along with the broad support of our Safety Specialists, all of our Field Supervisors are required to complete an in-house OSHA-30 Hour certification which guarantees there is always someone on every jobsite with comprehensive safety knowledge. As part of our continuing effort to advance the careers of our employees, Encore Electric sponsors an annual in-house career fair. This is a great opportunity to achieve the next step of your career with Encore Electric. Everyone is invited to participate in this exciting exchange of information between those aspiring to new positions and those looking for people within the organization to fill them. Encore Electric is a special place. our craftspeople to define the best practices of our industry. Why should you consider joining us? Download this guide to read all about what makes Encore Electric special. 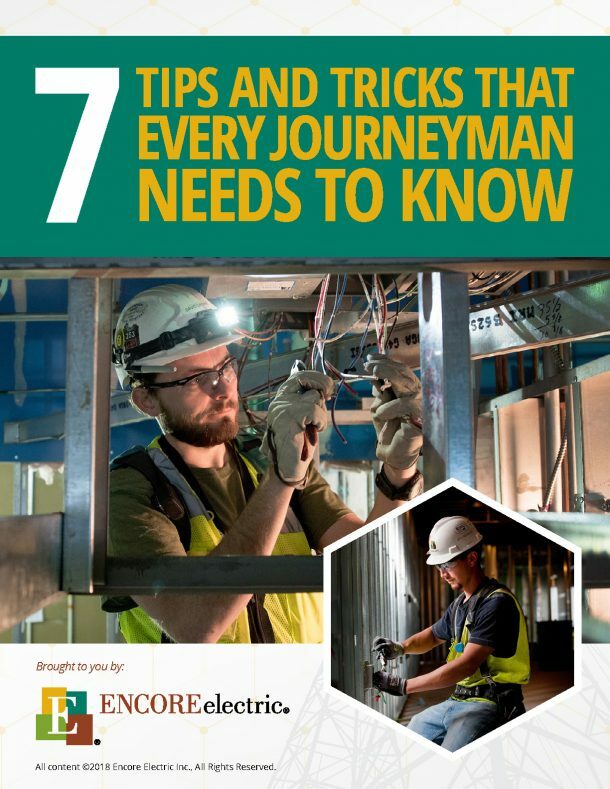 Enter your email to get your free guide, 7 Tips and Tricks Every Journeyman Needs to Know!